EWN reports thatÂ President Jacob Zumaâ€™s question and answer session in the National Assembly on Thursday wasÂ Â abandoned without him uttering a single word. Speaker Baleka Mbete adjourned parliamentÂ after the Economic Freedom Fighters (EFF) chanted â€œpay back the moneyâ€ and demanded Zuma declare when he would reimburse a portion of the R246-million of taxpayersâ€™ money used on security upgrades to hisÂ Nkandla home. While the EFF insist they are simply trying to hold Zuma accountable, other opposition parties are growing weary of the theatrics from Julius Malema & Co.
Zumaâ€™s office has already expressed its disappointment with the disruption, but itâ€™s parliament â€“ and everything it represents â€“ that emerges worst off. 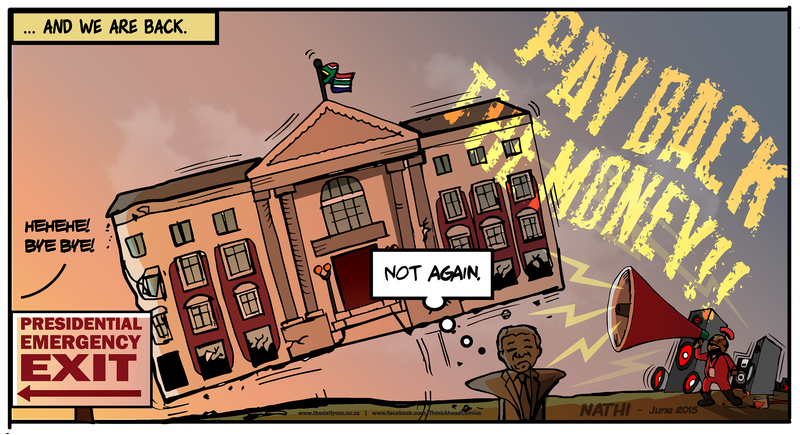 Oh well, Zumaâ€™s next expected in parliament in August â€“ watch this space.